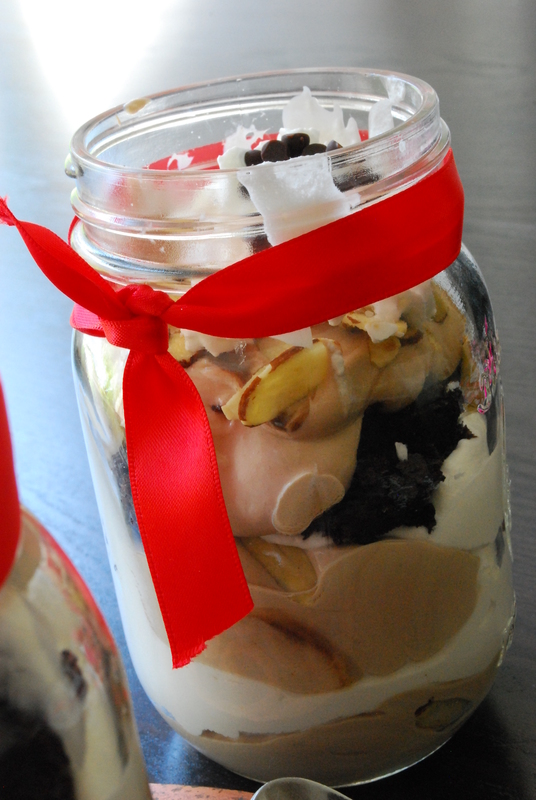 Lightened-Up Mocha Almond Fudge Parfaits & A Giveaway! So I’m trying to be better with eating well. I understand a lot of my recipes aren’t necessarily the healthiest (hello, I can go a little crazy with my recipes! ), but ultimately, my personal belief is that everything food-wise should be enjoyed in moderation. However, I also know there are some people (like myself and uh, some of my family members) who have a hard time with self-control and would rather just avoid the temptation completely than trust themselves with a big batch of cookies. I get it! Sometimes, I can’t even trust myself to just have one or keep my portions in check (I’m looking at your after-lunch and after-dinner and after-dessert desserts). So I try to make some healthy alternatives for people who would rather go cupcake crazy with lighter recipes they can feel less guilty over. It also makes me happy since I love being as crazy as I can around virtually guilt-free fare. After SlimKicker contacted me about doing a giveaway, I looked around on their site and became inspired. SlimKicker is a calorie counter that allows you to track your diet and fitness goals into a level-up game with points, challenges and rewards. It’s easy to level-up by tracking your healthy eating habits or exercises, or completing challenges, like quitting soda for a week. They even have a recipe section that caters to diets like Weight Watchers and Medifast. So really, it’s full of awesome stuff to love. And even better, they’re generously giving away this awesome Heart Rate Monitor Watch so you can track your progress any time of day. To enter, all you have to do is leave a comment with a fun or unique suggestion for a fitness or diet challenge. What would you like to do? Eliminate sugar? Run a mile a day? Do jumping jacks during commercial breaks of Pretty Little Liars? SlimKicker will choose a winner on 7/14/12 and notify the winner shortly thereafter. This giveaway is limited to US residents only. I love brownies but sometimes find it hard to portion them out. Parfaits are a great solution! Just crumble them up, layer them between light mocha cream, toasted almond slivers and whipped cream, and you have a light and yummy treat for hot summer nights or days when your chocolate craving is through the roof. For these, I used Trader Joe’s Guilt-Free Reduced Fat Brownie Mix which uses non-fat vanilla yogurt to create the soft, fudgy brownies. 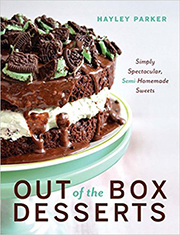 You can certainly use whatever brownie mix you have on hand; I just happened to have a box of this and thought it’d be perfect! 1. In a medium bowl, gently fold one cup of the Cool Whip into the mocha yogurt until combined. Set aside. 2. 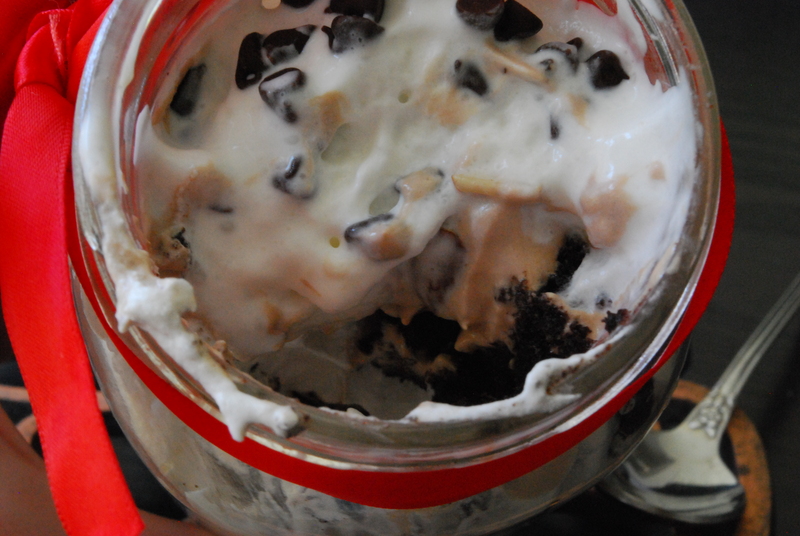 Among two mason jars (I used a larger size), crumble one brownie at the bottom of each jar. Top with a heaping Tablespoon or two of the mocha cream, followed by a sprinkling of toasted almonds and a dollop of Cool Whip. 3. Repeat layers 2 times. Top with remaining Cool Whip and mini chips, if desired. 4. Eat immediately, or cover tightly with the lid and store in the fridge for 1-2 days. So so so easy and perfectly fudgy. 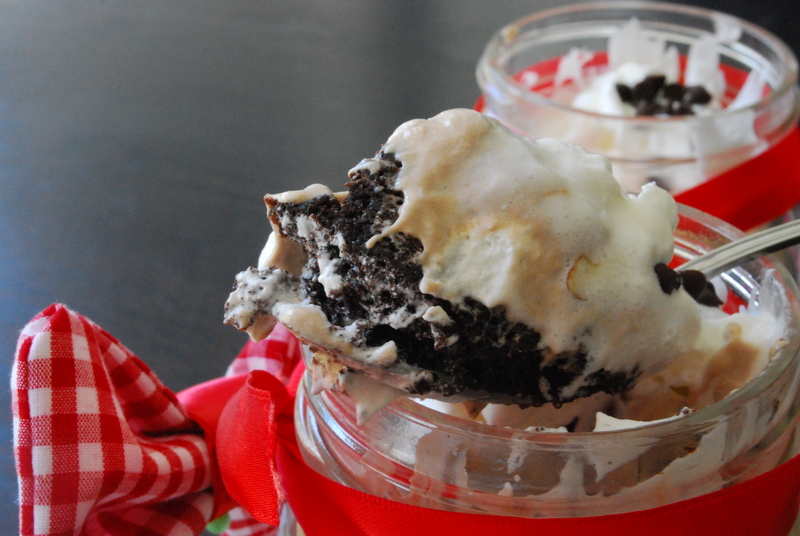 Fudgy brownies, rich mocha cream and a parfait that’s guilt-free? Me likey. Good luck with the contest, & have a great weekend!! And thank you, SlimKicker, for hosting this great giveaway! In the interest of full-disclosure, SlimKicker is generously providing this prize to one of you. All opinions expressed in this post are 100% my own. I think bouncing up and down on a trampoline sounds like a great and fun way to exercise and get that heart pumping. I could use a heart monitor at my age. Hope I win. I need to stop going through the drive thru with my kiddos….it might be quicker, but definitely not healthy. And also, those parfaits look fantastic! Eeek! I fell in love with these little jar treats when I saw them on Facebook last night–awesome!! My big diet problem is carbs–if I could cut out the bread and tortilla chips, I might stand a chance of dropping a few pounds. Awesome giveaway! I challenge my niece to jump rope contests or we play Just Dance! I also gave up on the foo foo coffee drinks …. Iced coffee with only a splash of skim milk. Love love love your blog. 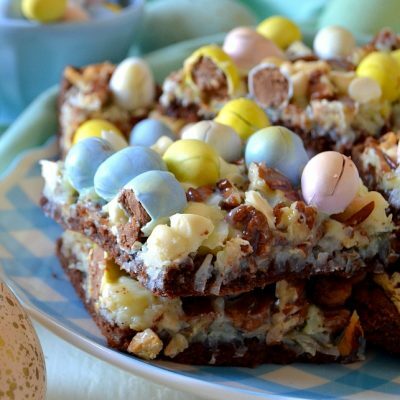 I would like to start the Couch To 5K exercise plan AND try to cut out sugar.That sugar one is a hard one but this recipe looks sinful!!! My favorite thing to do for exercise is to get on the treadmill and watch action movies as I walk, the adrenaline keeps me going and it makes the time pass quickly. Or you could just read the hunger games while you run, it’s good motivation XD. These look delicious! To get in shape I always meal plan and log on my phone.. Just to gauge what I’m doing. For exercise, I start out doing 10 crunches, 5 pushups, and 20 jumping jacks a day. Then each day I add 1 pushup, and 5-10 crunches & jumping jacks. Also do jumping jacks with 2-3 pound weights for an extra burn! It’s so simple and an easy way to get started in a basic workout routine. Well…I’m not one to talk about portion control or diet tips. No siree. BUT, I try to run a few times a week and I do some sort of exercise every day. Like lifting a spoon to eat these parfaits. I run every day. I hate it. But I do it. Ugh. 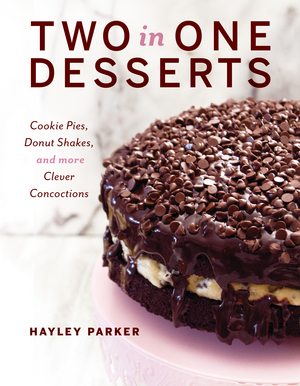 Also– I’m pretty good at lightening up my dessert recipes. Like, way good at it, actually– BUT I’m really horrible at eating ALL of whatever I’ve made in one sitting. For reals. 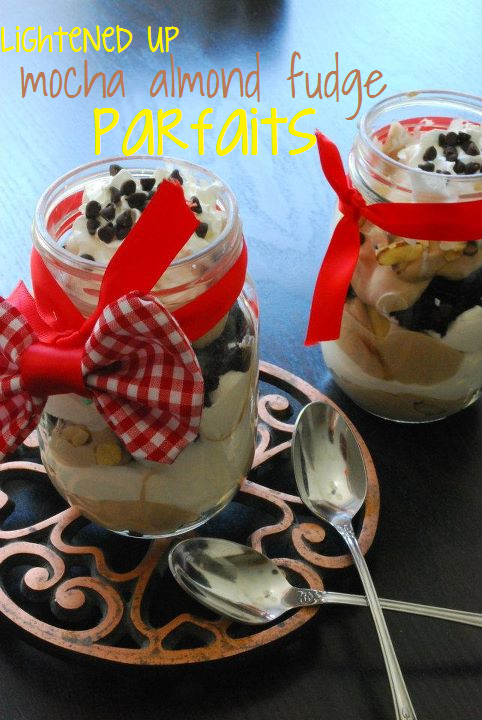 These parfaits look decadent! Who would know they’re light?? Where do you find mocha yogurt? Hey! So I found mocha yogurt at Trader Joe’s! It’s actually really good, with chocolate on the bottom 🙂 never had seen it before! I am trying to run at least a few times a week. Not sure how that’s gonna go…. i want to run a mile a couple of times a weelk. My exercsie goal is that I want to run 3 miles a day – but people in hell want ice water too, so that’s not going to happen. Honestly, I just want to discipline myself to take the time to go through my Richard Simmons DVD once or twice a day – yes, that’s right, I said Richard Simmons: Don’t judge. Ali–walking is one of my favorites, too!! I try to walk everywhere. It can be as easy or challenging as you want; I love that! I bring my jump rope when on vacation. I can really get my heart rate going. It is easy to travel with!! The paleo diet and cross fit are the newest and most effective ways to get in shape and lose weight. 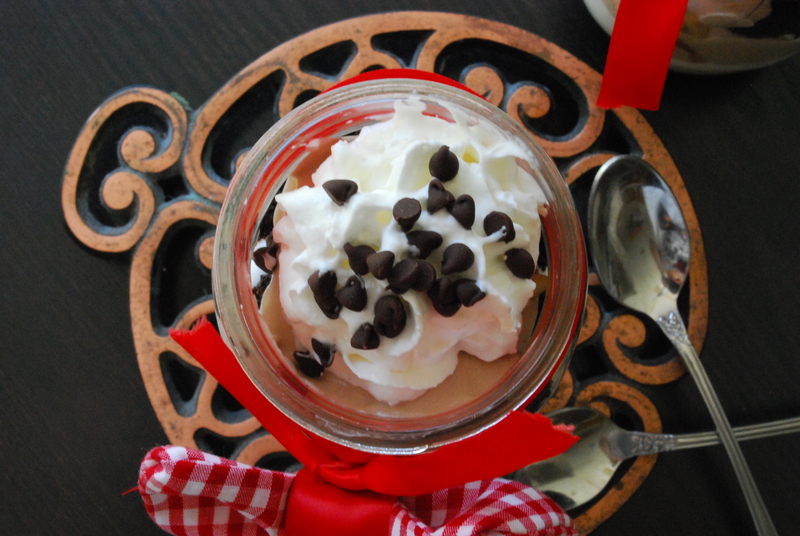 I’m loving this parfaits with cool whip and now I’m off to Trader Joes to find mocha flavored yogurt too! Does it qualify as an entry if I walk the 15 something miles to get there 🙂 No really, I’m in love with Warrior Sculpt at my gym. It’s like a parfait-eating calorie eraser. I would just like to ride the bike at the gym 3x/wk. I’ve gain a ton of weight since starting the blog. Time to reevaluate. These little parfaits look wonderful, Hayley. I have an odd love of ice cream, seriously can be a problem. My solution should be to cut it out, but alas that is too harsh. Instead i have found a great replacement- Chobani Vanilla Chocolate Chunk greek yogurt. Seriously- delicious, especially when you add strawberries. So good. Next i am going to try putting it in the freezer, to give it a similar texture to ice cream. My challenge idea is to do a mental cleanse. Which means to not allow yourself to have any negative thoughts, to meditate everyday, and to focus on the present moment more. My challenge is to give up potato chips. I have high blood pressure so I really need to stop eating these. I don’t buy them but the challenge surfaces beause they are free, open and available at work every day. AAGGHH! A fun challenge would be to try one new fitness activity every day for a week…maybe find some new form of exercise that you never even knew about! On my list is “Hot Hula Dancing” and “Zumba”! A great fitness challenge would be to set your alarm ten min earlier every morning and do an ab routine of planks and sit ups to get that six pack!